Browse Mobile Suit Gundam: Alternate Universe Gallery: Recent | Popular. I love it, but that you known already, right? The color was fine since the begining, but you work on it again and again, and then it is perfect. I'm in the list ... I'm happy!!!! PS - you meant show me the "way" not "why" correct? Hello there. Woah is a very nice fairy and the wall is very clean. The bg is cool and the fx are great. I like a lot the grass and how the wind moves it. The girl is too nice and the light fx on her are very good. Nice wall indeed. *fav 4 sure* :) Keep it up. awesome wall, you did a great job with the bg. nice choice of colors too, they match the scan very well! Great wallie Semanga ! Like allways ! 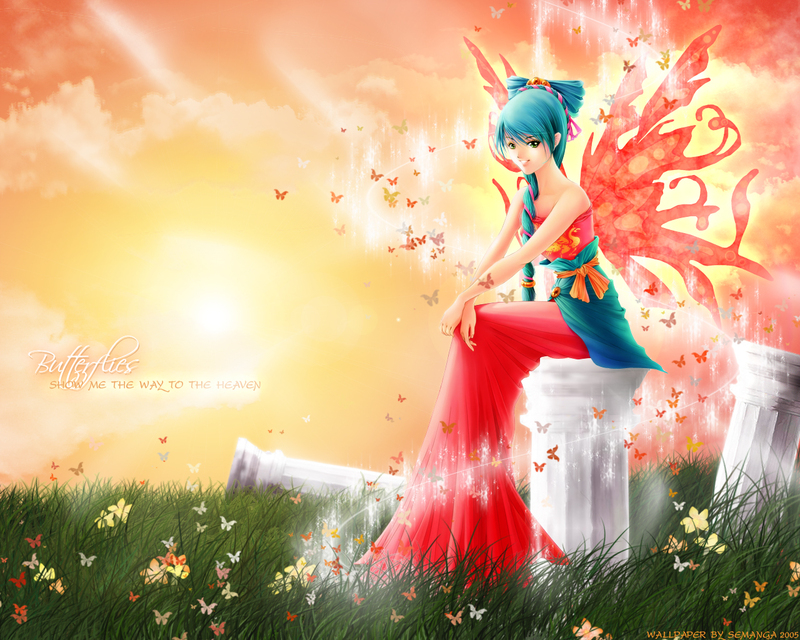 The butterflies looks amazing and chara is so preety ! I also love the clouds you made ! Great wall i love it ! Awsome job Semanga *Hugs*..... props to your skills. I really dig how the colors of the butterflies reflect the colors of the sky ..... it really brings the whole thing together. There is some wierd fuzzy grass thing by the end of the left hand pillar.... but its an A+ wallpaper to me. As always Semanga ... thanks for sharing your work and bringing beauty to my desktop. das ist mit abstand das schoenste wallpaper dass ich hier in mt gesehen habe. amazing... it's like a painting... don't ya think? one thing though... maybe you should have changed the roundness jitter a little bit, just to make it a little more realistic? Wow, the girl ist really adorable! I really like the warm colours and the whole wallpaper looks very romantic. Very good work. Sorry I can't see it or comment on it. Anyway I hope you are well and happy. There's not much point in me coming here any more if I can't see any images ... I probably should say good bye.